Today’s business leaders understand that culture is a vital part of building and maintaining a successful company. A strong, positive company culture reinforces your company’s beliefs and values, and helps guide employees as they work toward shared goals. Some of the most successful companies today have strategically developed a recognition culture that rewards employees for hard work year-round. An employee recognition program is a great way to promote, encourage and reward behaviors that support your company’s cultural values. Employees who feel respected by the personal acknowledgement of their value to the company make the culture stronger—and suddenly, a recognition culture is born. Here are the five things that all companies with a recognition culture have. Consider these as you work to align your recognition programs with your corporate culture. Although a company may have an employee recognition program in place, it may not be adequately branded. When a recognition program doesn’t have a strong identity, it can easily be forgotten. The solution to vague, often scattered recognition efforts is to give your recognition program a creative name, theme and identity mark. A program with a clear identity will help build early awareness, understanding and adoption, creating a common link across your entire organization. It will consistently reinforce the recognition culture you are trying to create and make employees feel more invested in contributing to something greater than an isolated moment. When you work with Hallmark Business Connections to build your recognition program, our Hallmark creative team will help develop a theme and visual identity to resonate with your cultural values and program goals. Don’t leave any room for interpretation when you define your organizational values for your recognition program. You can start by looking at your existing corporate values, but don’t just copy and paste them into your program. Take the extra step of identifying the specific behaviors that show those values in action. That way, your employees will know how you expect them to act and also be able to identify others exemplifying your cultural values. Building a recognition culture relies on participation, reach and frequency as key performance indicators. 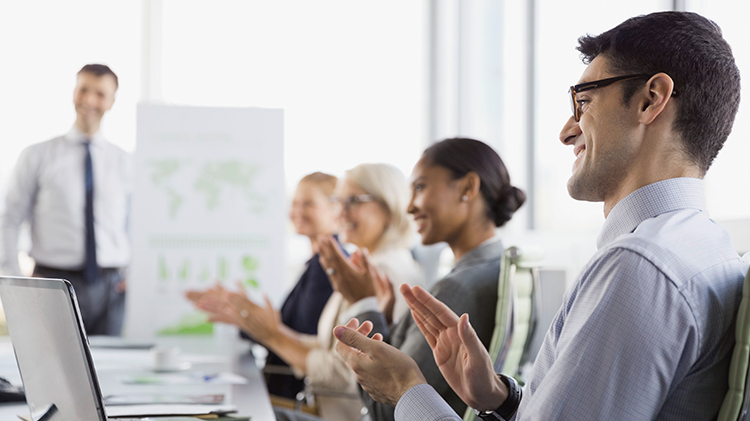 You’ll want to have tools and resources in place that make it quick and easy to pause for recognition and express just the right message to convey appreciation. Hallmark Business Connections provides real-time technology solutions that ensure it will only take a minute to recognize a moment. No two people are alike, so it can be a challenge to find rewards that appeal to everyone. To inspire every employee, work to offer a rewards program that provides a broad range of choices for how employees can celebrate their accomplishments and treat themselves in big or small ways. As a program owner/manager, keep leaders and other stakeholders engaged by providing frequent updates about the volume, trends and organizational insights you’re gaining from your recognition program. Share what you’re learning based on what behaviors, activities and events are most recognized, and spotlight specific examples and experiences your program has created for employees. Maintain excitement for the program among employees by highlighting results and examples in company newsletters and intranet sites. Encourage managers to use regularly scheduled department meetings to spotlight employees on their teams who have been recognized. How can Hallmark Business Connections help with your recognition culture? From strategy to branding, technology platform to rewards, Hallmark Business Connections provides a one-stop solution package for creating an effective and lasting employee recognition program designed to support and build your company’s recognition culture. Robust online reports and dashboards help you fine-tune the program over time to ensure that it continues to meet the needs of your company and employees alike. Ready to learn more? Get in touch with us today.